You might need a few of these! rawing is one of life’s simple pleasures, something we pick up as children and from which we can continue to find enjoyment for years to come. 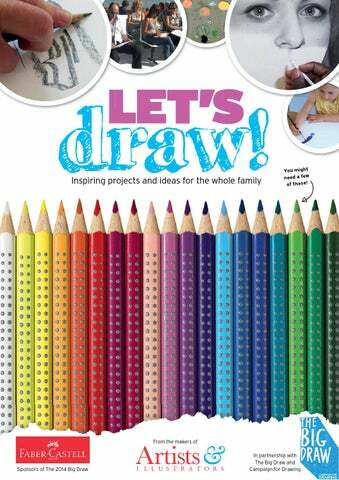 Brought to you in association with The Big Draw and Artists & Illustrators magazine, this free 16-page Let’s Draw supplement has been designed to encourage the whole family to discover (or rediscover!) the simple joys of putting a pen or pencil on paper. We hope that our simple project ideas and easy-to-follow demonstrations provide a little inspiration for you at home and don’t forget to take part in a Big Draw event during October – find about some of the highlights on page 5. £20 GIFT VOUCHER to spend on art products and materials of your choice online at Art Discount Subscribe to Artists & Illustrators, the UK’s biggest and best magazine for artists, and receive 1 year (13 issues) for just £39.95 (usually £50). PLUS we’ll send you a £20 voucher to spend on anything you like at Artdiscount.co.uk (one of the UK’s largest online retailers of fine art products and materials) absolutely FREE! other Big TO DO: Fi nd i n m y area Draw events draw – that drawing is only for some tiny, bizarre elite of ‘artists’. And, of course, when people get to art school, they are then taught that drawing has almost nothing to do with art at all. All of this is an outrageous waste of human talent and expressiveness. Most of us can draw. All of us learn to look, to see the world more sharply, and to enjoy the simple pleasure of making something, when we learn to draw. Talk to any engineer, inventor or designer, and you begin to understand how fundamental drawing is to the economy. And as I have learned after my stroke, drawing is a wonderful therapy and a way to connect again with the beauty of the world around us, for the princely sum of the cost of a 3B pencil and a cheap notebook. To undertake a campaign on behalf of drawing is therefore to try to wrench back part of the culture that has fallen away, and to give ourselves a tool and practice that should have been ours all along. It’s not a campaign for ‘art’, still less for the art market. It’s a lot more important than that. Sit down opposite a friend or family member with a pad of paper and a pen or pencil. Now, try to make a line drawing of them without looking at your page – focus only on your sitter at all times. Hard, isn’t it? You won’t produce a perfect portrait, but this quick exercise helps hone your observation skills. Turn on the TV. Watch part of a favourite programme and then turn the TV off again. Try to imagine what happens next. What might the characters be doing? What locations might they visit next? Draw the imagined scene. If you have a digibox, you could even pause the programme and see how your drawing compares to what really happened on the screen. NEW WORLDS Ever wanted to visit another planet or go back in time? Well, now you can by drawing yourself in a whole new world! Find an old photo of yourself or print one out on the computer. Take a pair of scissors and carefully cut around your silhouette to remove the background (kids – you can ask your parents to help with this bit!). Glue the back of your cut-out figure to a larger sheet of white paper. Now, draw yourself a new location on the paper around your photo. Where will you go? The only limit is your imagination! Look around your house for an object with an interesting shape – maybe a plant, a toy or a bunch of bananas? Place the object on the table in front of you and try to draw it in a single continuous line without lifting your pen or pencil off the page. Try to describe both the outline of the object and also any key internal shapes or details. This game is a great way of learning how shapes relate to one another and developing hand-eye coordination. This is a great lesson in style over accuracy! Are you left- or right-handed? Try putting your pen or pencil in the other hand to complete a drawing of a person or a scene. You will no doubt find it harder and struggle to achieve an accurate likeness but you might also find it is a more expressive or emotive drawing as a result. This is a fun one to try after a family holiday or day trip. Take a large sheet of paper and divide it into rectangles using a black pen and ruler. Challenge your kids to create a cartoon telling the story of what you did that day, drawing the people involved and the places visited in turn. If they are older, you can call it a ‘graphic novel’ and get them to add speech bubbles or develop the expressions on the characters’ faces. Date the drawings – they will become fun visual diaries to look back on in years to come. Sounds incredible Play some music and draw what it makes you feel or think about. Let the rhythm of the music influence the speed of the marks made. Use coloured pens or pencils to reflect the mood of the music. Do this with friends or family and compare your drawings of the same songs at the end. Find a dry-wipe marker, chalk pen or similar that will write on glass and wipe away easily (be sure to get parental approval and have them test it in a small corner first!). Choose a large window in your house and make an outline drawing on the glass of the scene you can see outside. Embellish the drawing with patterns, shapes or extra characters – animals, people or maybe even imaginary monsters. Have fun turning the real world into something more fantastical! oung British artist Kelvin Okafor only graduated from Middlesex University in 2009 but he has already gained a huge following for his beautiful tonal portraits of friends, family and celebrities. 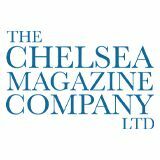 His work has been featured by the BBC, The Guardian and Daily Mail, while his debut solo exhibition at London’s Albemarle Gallery last spring was a great success. “My art developed from a sort of obsessive desire to achieve greater realism and emotional expression in my drawings,” he told us. I begin by studying the subject from either a photograph or a live sitting and embedding an image of them into my subconscious and memory. Rather than creating a grid, I lightly sketch the subject and define the background. It is essential to understand the tonal values, making note of the darkest and lightest. This subject has medium to dark brown hair so a light background provides the needed contrast. The fairer the hair the darker the background needs to be and vice versa. I layer a base using Cretacolor graphite powder then build upon that with Cretacolor charcoal powder. I then work in details with various pencil grades and use erasers, particularly the Tombow Mono Eraser, to create highlights. I measure proportions, determine the scale of the drawing, and shape the rest of the features based on the eyes. I believe the eyes show the subjectâ&#x20AC;&#x2122;s soul and are most often the focal point of the drawing. I never impulsively create a portrait. I like to study the subject from different angles and then work to express the essence or mood of the person through my drawing. n my new book, Draw Paint Print like the Great Artists, I have chosen some of my favourite artists who have been an important influence on me, helping me to develop my own style over the years. By exploring their techniques, I began to understand the essence of their work and how they see the world around them. Every artist learns by looking at the work created by others, and then picks up bits of that and makes their own art in their own way. Through them, you will discover new working methods and new ways of exploring image making. It may be something as simple as using scissors rather than a pencil, or being fascinated by a new shape or a playful exercise. Klee made all kinds of lines in his work. Some of them looked as thought they were ‘scratched out’ of the paint. You can make similar kinds of marks by scratching lines out of paint-covered wax. It is called ‘scratch art’ or ‘crayon etching’. It is very simple to do. Draw a border on the white card. Paint over wax crayon with black acrylic or gouache paint with a wide, flat brush. Cover evenly. The paint should be quite thick but not lumpy. TO DO: Enter this competition today! Rub wax crayons onto the paper, up to your border, leaving no white spaces. Rub away surplus wax with kitchen towel. Scrape your pattern into the black paint to reveal the wax colours. Rub away the surplus dried paint. Siân Dudley’s fun drawing project will encourage the whole family to get hands on The poor old pencil is often overlooked, simply because they are so commonplace. For me picking up a decent pencil is still an exciting experience; the feel of the pencil as it glides over a lovely paper with a decent ‘tooth’, and the range and expressiveness of the marks I can make, continue to delight me. Use this activity to encourage your children to explore the possibilities of graphite pencils further. Have them use all their senses – note the way the pencil feels in their hand, the smell of the wood, and the sound it makes on the paper. Take this opportunity to compare the different grades of pencil, and learn how and when to use each of them. Encourage your kids to play with the three grades of pencils to experiment with the marks they can make and notice the differences between them. Have them try using different pressures: tickling the paper for light marks, pressing harder for darker ones. What happens when they layer the graphite? Can they make marks ‘shine’ by burnishing them? How do they feel? Encourage them to alter the angle at which they hold the pencils. What sorts of lines can they make now? Could they, for example, make marks that look ‘slow’ or ‘heavy’? On the same piece of paper, have them create a new set of hand shadows and draw around each of them again, this time using the 4B pencil. Once you have a ‘layer’ of hands drawn with that 4B pencil, change again to the 9B pencil and repeat. You will end up with an arrangement of hands, interwoven but distinguishable because of the quality of lines made by the different grades of pencil. You can continue until each member of the family has had a turn or carry on to cover a larger sheet of paper! Angle your light source so that it produces good shadows on the page. Have your children place their non-drawing hand between the light source and the paper, playing around with the shadows until they find an interesting shape. Using the HB pencil, have them draw around the outline of their hand’s shadow. Take turns to make shadows, overlapping HB outlines and building up interesting shapes on the paper as you go. Hands wobble so have them rest their arms on something if necessary. Now have them add texture, tone and pattern using the range of marks they discovered in the first step. They do not have to follow the shapes of each hand, but instead encourage them to look at the patterns that the shadows have made when they overlapped. As they fill in each shape, try to have them keep an eye on the balance of tones and marks across the whole page. The result will appear abstract at first, but on closer inspection it is also a lovely record of your family’s hands. Lastly, don’t forget to date it! When did you first start drawing? I remember being three years old and drawing lots of circles. As soon as I picked up a pencil, I knew it was what I liked doing best. Why is drawing so important? It teaches you how to really look at things and to understand them. Drawing can do such different things. When it’s very exact, like architectural or medical drawing, it’s an excellent analytical tool. Plus, a lot of people get a lot of pleasure out of it. I think drawing is extraordinary. days: carrying my portfolio in a black case and going to see people. This was before the days of websites so I spent a couple of months reaping not much success. My first commission was for The Times and it was to fill in for someone who was on holiday. August is a good time to pitch, even now, because a lot of people are away and there’s always drawing to be done. What is your career highlight so far? Being asked to do the regular comic strip for The Guardian in 1977 because it was something very different and exacting. Are there any lessons that have stuck with you? My early days at The Guardian taught me how to draw quickly. They gave me some copy and said they wanted the illustration by 5pm. There was no time for second thought but it allowed me to develop my own visual handwriting. It was overwhelming but I really liked it. I remember [the director] Stephen Frears remarking how the book’s graphic novel layout made it easier because it was like a ready-made storyboard. When you’re writing a graphic novel, it’s like drawing a film in a way, only I’m in charge of everything – the direction, the script, the props, the camera, the lighting. What one art product can you not live without? What’s the best piece of advice you’ve received? Being told I’ll make 1,000 drawings that I’m not happy with but being assured that it’s perfectly normal. What’s the biggest misconception about being an illustrator? Your strip Tamara Drewe was adapted into a movie in 2010. How was that? It used to be a beautiful black Berol Karismacolor pencil but they’ve been discontinued. I’m now using a Faber-Castell one, which is still very good, but it makes me sad when a brand I love no longer makes a product. whether they’re vain and such like. Hopefully then there’ll be some sort of recognition for the reader. Everyone thinks it’s such fun. I’ll bump into someone after a deadline and they’ll say, “Oh, you’re still doing your sketching? What fun!” They believe that you sit at home with a teapot at your elbow, a cat on your lap and it’s all very cosy. Apart from art, what’s your biggest talent? I can tap dance a bit. I’m quite good at doing impressions of animals too, like chickens, cows and cats! Sell your work, without paying any commission! All this for only £2.49 per month!